Okay, I’ll admit it’s not really that hot, compared to the heat in the South. 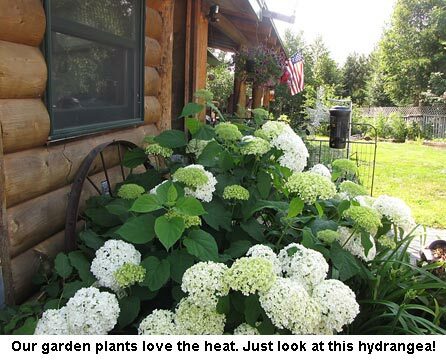 But for Northern Minnesota, it’s been hot and muggy at times. Luckily, the garden loves it and is doing very well. So are the weeds, which we are slowly getting a handle on. The blankety-blank ground squirrels ate nearly all the leaves off our melons in the second hoop house but Will thinks one plant is still alive. We’ve waged war on the squirrels with Mittens and the dogs killing seven in the last three days. Hopefully, one of the seven was our melon-eating culprit. Friends of ours have a greenhouse/garden shop in Cook called The Watering Can. We sell them our pumpkins and fancy gourds and squash in the fall and they make us a great deal on their leftover peppers. Luckily, Diane and Gina grew several of the heirloom peppers we grow so we are planting the east hoop house in peppers as it’s too late to start melons again. You learn to roll with the punches when you homestead! Will cut hay yesterday and hopes it doesn’t rain before he bales it tomorrow. Today is hot (85° F) with a small breeze so the hay should dry well. 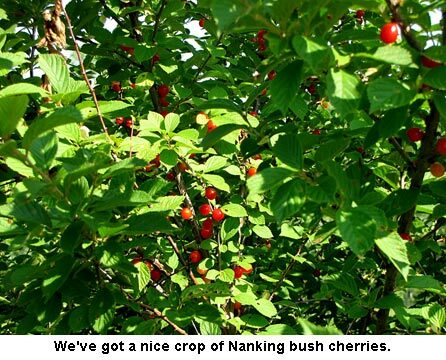 We’re getting a nice batch of pie cherries from our Crimson Passion and Evans Bali trees (both Zone 2) For the first time in seven years, we are getting fruit from our Nanking bush cherries. We’re going to pick this evening as the darned Cedar Waxwings already cleaned out one Nanking bush of lots of ripe cherries. Yep the weather here in MN has been great for the squash and melons…mine have huge leaves and producing like crazy…sorry about yours though! the darn bunnies got my pea crop, but I may put in a late crop and see if I can get some this fall. as for your hopi pale grey…reminds me of my sunflowers…i plant them, but never come up or if they do, they are in the middle of my tomatoes, my gourds, broccoli…I think they have legs and move to where the soil is best! by the looks of things, your gardens are being very productive all the same! take care. I have to set dishes of ammonia around my squash to repel the raccoons maybe the ground squirrels wouldn’t like it. I fought ground squirrels in CA. Worthless creatures. 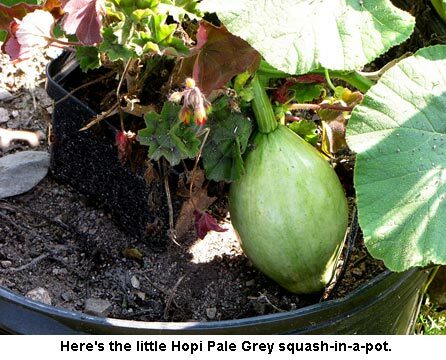 Good to see the Hopi Pale Grey growing in a pot. I think I’ll try that next year. I like containers – easier on the old arthritic back. Hot you say ? Here in Arizona we have had record heat 118 that is and it just killed everything but the weeds…finally got some rain but no sense putting any new seed’s out until middle of October…your flowers look beautiful Jackie.